Bitbucket is a web-based hosting solution for projects that use either the Mercurial or Git revision control systems. 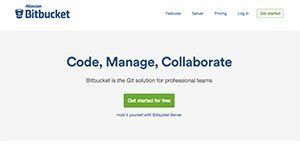 Developed for professional teams, BitBucket enables users to code, manage, and collaborate on Git projects. BitBucket provides tons of benefits for professional developers and code workers. It comes with a distributed control system that allows easy collaboration and massive scaling. It can be deployed according to the needs and sizes of teams and users have the option to host it on their servers or in the cloud. BitBucket also boasts unlimited private and public repositories. Workflow is secure with granular permissions. Integrations with leading business apps including Bamboo, JIRA, and HipChat enable users to work effectively and see their productivity zoom up. Since each organization has specific business requirements, it is advisable for them to desist from searching for a one-size-fits-all ideal software solution. Needless to say, it would be pointless to try to find such an app even among market-leading software platforms. The clever thing to do would be to jot down the various vital elements that need consideration such as main features, finances, skill levels of staff members, company size etc. Then, you should do your research thoroughly. Read some BitBucket reviews and check out each of the other apps in your shortlist in detail. Such in-depth groundwork can make certain you reject ill-fitting platforms and select the app that offers all the features you require for business success. We realize that when you make a decision to buy IT Management Software it’s important not only to see how experts evaluate it in their reviews, but also to find out if the real people and companies that buy it are actually satisfied with the product. That’s why we’ve created our behavior-based Customer Satisfaction Algorithm™ that gathers customer reviews, comments and BitBucket reviews across a wide range of social media sites. The data is then presented in an easy to digest form showing how many people had positive and negative experience with BitBucket. With that information at hand you should be equipped to make an informed buying decision that you won’t regret. What are BitBucket pricing details? What integrations are available for BitBucket? Pros: Bitbucket is simple, affordable and easy to set up and it offers great set of features. There is an option to pull request management which is extremely useful for code reviews. Because our team constantly grows it allows us to take full control of code-base with less work. Cons: We need code review to be even more expanded so we don’t have to use UpSource in order to review great changes. Pros: Bitbucket is great product and great alternative to Github, it is affordable and easy to use. They offer free model and when you sign up for a monthly account they provide unlimited number of creating and keeping private repos. This program integrates well with Atlassian Products and can be used from medium to enterprise sized industries. They offer great documentation and responsive support for their users. Cons: When I wanted to set up the Bitbucket on Mac it was very slow experience, it took me a while to configure my first steps. Also, I have faced some load issues on their site, I’m waiting for a few minutes to load my dashboard. But I can tell that I haven’t faced these issues lately, maybe they have improved them. If you need more information about BitBucket or you simply have a question let us know what you need and we’ll forward your request directly to the vendor.